With all the technology we have to deal with these days, there is an inevitable mess of cables. BlueLounge is a company that creates gadgets to help manage that mess. We have the opportunity to review some of those items today. 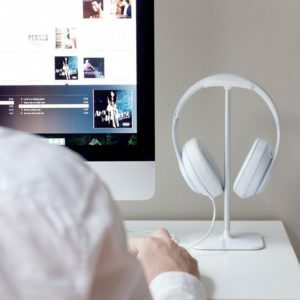 This device is a stand to hang your headphones on. With dimensions of 4.25 x 4.25 x 9.6 in, Posto will give you a place to store headphones and reduce clutter on your desk. It comes in black or white, and will accommodate all sizes of headphones. The headrest is rubberized- made to form to the headphones. The base is a sturdy aluminum. It looks very classy. You can purchase a base of your own for $19.99. Discouraged by cables everywhere? This product comes in a mini size for little cables like MicroUSB and Apple Lightning connectors. They also come in a regular size for larger cords. The sticky back is perfect for sticking to desks, walls. People even use them in their bathrooms! They come in many color choices- black, white, bright, and muted. You get six CableDrops in a package. If you purchase the mini version, there are 9 in the package. They both cost $9.95. Their plastic build is firm, but somewhat flexible. The adhesive backing eventually becomes permanent over time, so you should take precautions when trying to remove them. We’ve reviewed similar management systems for earbuds and their cables. This system is unique in that it has a magnetic center that holds the earbuds. You could also store lightning cables in it. It’s also made of silicon- rather than the hard plastic ones we’ve reviewed in the past. There are different options of colors, too! There are ones in Dark Grey, Light Grey, Lime Green, Black with a Gold magnet and Blue with a Gold magnet. These handy gadgets are only $9.95 and make a great gift! The last BlueLounge product we have to review is the CableClip. As you can see, this is another gadget to keep your cords tangle-free. This is great, because if you’ve ever thrown cords into your backpack, you know that they often don’t come out so well. For $9.95, you can buy a package of 2 large, 4 medium, or 6 small clips. The large ones work great for thick power cords and network cables. 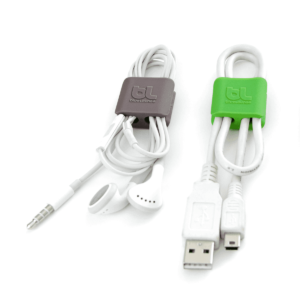 Medium ones will work well for USB and data cords, small power cords, audio cords and phone cables. The small ones are ideal for earbuds, small data cables and charger cords. We’d like to thank BlueLounge for sending us these great products to review at no charge. Our opinion is unbiased and fair, and no other compensation has been paid to influence our reviews.